In 1996, Dr.Thynn moved to northern California , and in 1998 established the Sae Taw Win II Dhamma Center of the Shwebawgyun lineage, as an extension of the original Sae Taw Win monastery in Burma. In 2001, a Jedi in the Burmese Theravada tradition was built on the center property; it is the first such Jedi in northern California. Sae Taw Win II provides accommodations for students and guests, as well as, for Dr.Thynn and her family. Currently there are about 40 students taking classes at the Center. An extended community of over 500 students come from all parts of the US and Canada to participate in retreats and seminars. Currently, Dr. Thynn and her students are raising funds for an interfaith relief effort for Sri Lankan Tamils in the wake of the Asian tsunami disaster. 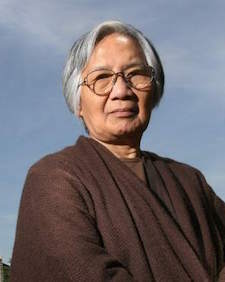 Dr.Thynn Thynn is a Burmese-born American Dhamma teacher who is a former physician and the mother of two grown children. While in her thirties, Dr. Thynn began training intensively with two Burmese abbots in vipassana mindfulness-in-daily-life practice. During this period, she also taught Public Health at the Institute of Medicine in Yangon . In 1984, Dr. Thynn met her kammic guru Shwebawgyun Sayadaw in Burma, and was inducted into his lineage as a woman master of adepts (mystics). As Buddhist monastic traditions are extremely difficult to establish in the West because of their patriarchal and strictly hierarchical nature, Dr.Thynn decided to establish the Burmese Yogi tradition as an alternative, and was herself initiated as a Yogi on September 9, 1999. The Yogi tradition is non-patriarchal, without gender bias, and uses Buddhist approaches to community-building. The International Women’s Meditation Center Foundation received Thai government approval on September 20, 2010.